It is realistically sized and proportioned. Can be used for parties, Halloween and so on. 1pcs Halloween Toy. Color: As picture shows. Size: 49cm. You can follow below process to chontact us. GBP 1.2 132 sold. If the brace is bigger for your teeth, you can cut with scissor along the gum line and shorten it. 【Kids & Baby】. 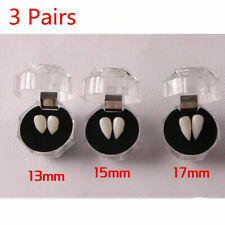 3 Pair False teeth(no denture adhesive). 【Water Shutter】. size:13mm、15mm、17mm Ideal for any cosplay. Can be used for parties, Halloween and so on. 1pcs Halloween Toy. You can follow below process to chontact us. It is realistically sized and proportioned. GBP 3.31 9 sold. It is realistically styled and painted. Capacity: 450ml. - Halloween cosplay vampire beverage bags. - Good quality, no taste, health and safety. - The bag have better toughness, Transparent. - Food grade PVC material, good materials. Capacity: 450ml. - Halloween cosplay vampire beverage bags. - Good quality, no taste, health and safety. - The bag have better toughness, Transparent. - Food grade PVC material, good materials. Colour: Transparent (as picture show). If the brace is bigger for your teeth, you can cut with scissor along the gum line and shorten it. Quantity: 3 Pairs. size:13mm、15mm、17mm Ideal for any cosplay. 3 Pair False teeth(no denture adhesive). If the brace is bigger for your teeth, you can cut with scissor along the gum line and shorten it. 【Kids & Baby】. 3 Pair False teeth(no denture adhesive). size:13mm、15mm、17mm Ideal for any cosplay. Quantity: 3 Pairs. Halloween cosplay vampire beverage bags. 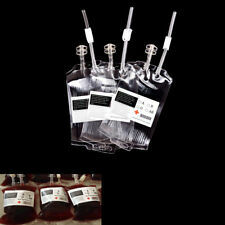 5 pcs Blood Energy Drink Bag. Good quality, no taste, health and safety. Supporting: Bag clip Stickers (not including syringe). Capacity: 400-450ml. The bag have better toughness, Transparent. Capacity: 450ml. - Halloween cosplay vampire beverage bags. - Good quality, no taste, health and safety. - The bag have better toughness, Transparent. Halloween cosplay vampire beverage bags. 1 x Blood Bag. Capacity: 350ml. The bag have better toughness, Transparent. Good quality, no taste, health and safety. Size(L x W). Capacity: 350ml. Halloween cosplay vampire beverage bags. Supporting: Bag clip Stickers (not including syringe). The bag have better toughness, Transparent. 1x bag( clip stickers). Color: Clear. Zombie cut-out Great Halloween decoration Colour: Multi-coloured Size: 60" . Plastic syringes. use in trick or treat Sweets box. Fill up with Fake blood. Good quality, no taste, health and safety. The bag have better toughness, Transparent. Halloween cosplay vampire beverage bags. Just only bags, inner excluding drinks. Specification: Material: food grade PVC material Color: Clear Capacity: 250-280ml. Features: Brand new and high quality Color:Clear Material: Food grade PVC material Size ( approx ): 18*10.5cm Capacity: 250-280ml Supporting: Bag clip Stickers (not including syringe and infusion tube) Packaged：1pc Conversion:1 inch=25.4mm or 1mm=0.0393inch. Footprints Size:7.8" 3.2". Bloodstain Size:5.6" 1.4". Occasions: Bedroom, Sitting Room. Removable and performing waterproof function. Shape/design: Halloween. 4pc Halloween Wall Sticker. It is made of PVC, and can be applied on smooth, flat walls, doors, glass, mirror, tile or furniture, but do not use on textured, wet surfaces. Halloween cosplay vampire beverage bags. Good quality, no taste, health and safety. Just only bags, inner excluding drinks. The bag have better toughness, Transparent. 4x bag (H01,H02,H04,H05,inner excluding drinks.). Halloween hand print decorations Made of gelatin Great for a scary themed party Colour: Red Size: 54cm x 15cm . Halloween cosplay vampire beverage bags. Good quality, no taste, health and safety. Supporting: Bag clip Stickers (not including syringe). Capacity: 300ml. The bag have better toughness, Transparent.